Louleigh has donated one of her bags for a giveaway. The winner was drawn in Episode 24 but hasn't claimed the prize yet. Emily of the FibreTown Podcast has released a new pattern the Esther Belle Shawl and she has donated a copy of this new pattern to give away to a viewer. The winner is announced in this episode. 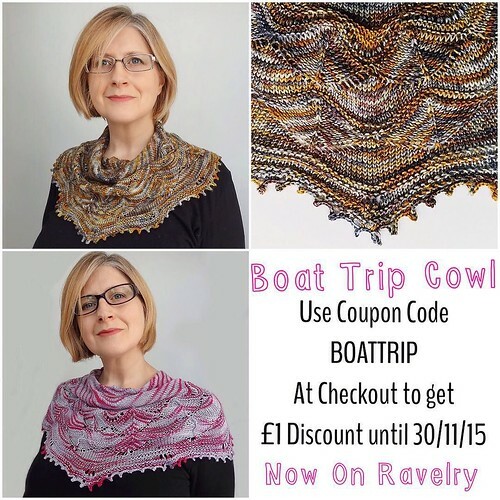 I've now released my Boat Trip Cowl pattern and there is a coupon code, BOATTRIP, that will get you a £1 discount, if you enter it in the Coupon Code box on the checkout screen. This code will expire at midnight GMT on 30th November 2015. I mention the yarn used Countess Ablaze Lord Kitchener 4ply and Siidegarte Siide-Quirlig, which I got from The Golden Skein. Fondant Fibre Fuzzlings in the Gone West colourway. Spun as a semi-worsted 3-ply construction, I got 178m of DK weight yarn. Cute Critter for Christmas was an improvised pattern. It used Sirdar Shaggy Scarf yarn in the 0607 Tan colourway and Hayfield Bonus Chunky in the 0936 Tan colourway. I referenced FreshStitches crochet patterns and Rebecca Danger's Big Book of Knitted Monsters (UK Link) (US Link) . Brother's Barley Hat is by TinCanKnits and is knit from Cascade 220 Superwash in the 885 In The Navy colourway. Grandmother's Favorite knit using Pigsah Peaches & Creme Solids in the 5 Eggshell colourway. Also giving some sensitive soap from Corinne T Holistic on ETSY. Pamela Stripes En Haute knit from my own pattern, using Posh Yarn Pamela in the I'll Get You My Pretty, The Door Just Opened For Someone and The Grass is Full of Stars colourway. Fondant Fibre Rolags in the Lina colourway. Rolags are made of alpaca, camel, Shetland and silk. Spun using my Spanish Peacock Bead Whorl spindles. Toddler Tank Top using Rico Baby Classic DK in the 16 Purple colourway. Based on the shaping of Playing Out by Sirdar from Issue 101 of Simply Knitting. Quynn by Woolly Wormhead knit in Babylonglegs Radiance Aran in the Stingray colourway. I need to make a monster for my second youngest nephew and a hat for my eldest nephew. Thinking about doing a Self Indulgent Craft A Long starting on Christmas Day. If you have any thoughts about this CAL, post in the episode thread on the Ravelry Board. Nicole C Mendez Stripy Gold Sock in #2 colourway. The Wool Barn Silk Sock in Gun Powder. The Wool Barn Alpaca Sock in Denim. The Wool Barn Rustic Sock in Adria. The Knitting Goddess BritSock in The Luggage colourway. Thanks for reaching out as you always do!